Having secured a stronger minority government in Tuesday's general election, Prime Minister Stephen Harper said Wednesday he was pleased with the result, despite not having a secured a majority that was once thought to be within his party's grasp. 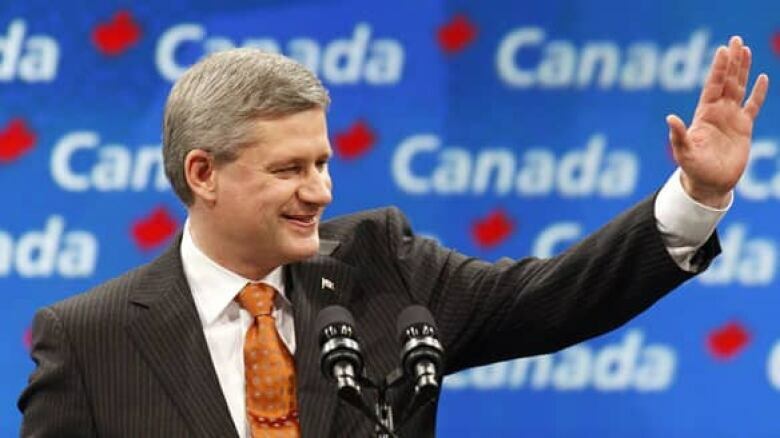 Stephen Harper told supporters in Calgary that he intends to work with Parliament to safeguard the economy. ((Chris Wattie/Canadian Press)) Having secured a stronger minority government in Tuesday's general election, Prime Minister Stephen Harper said Wednesday he was pleased with the result, despite not having secured a majority that was once thought to be within his party's grasp. "I'm very pleased with the strengthened mandate we've received," he said. "We are gradually establishing a base of the Conservative party across the country. We had important breakthroughs among female voters, among ethnic voters, and in a couple of the big cities. We made some significant gains in the Greater Toronto area and in the Greater Vancouver area." The Conservatives took 143 ridings, up from 127 in 2006, while Liberals were elected in 76, a drop of 19 seats from the party's standing at dissolution. Bloc Québécois candidates were elected in 50 ridings, while NDP candidates took 37 seats, a gain of seven seats over the last election. Two Independents also held on to their seats. Throughout the campaign, Harper refused to speak of a potential majority, but repeatedly asked Canadians to give his party a "strong mandate" in the face of growing economic uncertainty. "Canadians have voted to move our country forward and they have done so with confidence," Harper told a rally in Calgary early Wednesday as supporters celebrated the party's victory and the end of a tumultuous — and at times rancorous — 37-day campaign. The Tories' fortunes were buoyed early in the evening by surprising gains in Atlantic Canada, especially in New Brunswick, despite being shut out in Newfoundland and Labrador. In British Columbia, Conservative candidates were elected in 22 ridings, a gain of five from 2006, followed by the NDP with nine seats and the Liberals at five. But the Tories' hopes for a majority government were foiled in large part by a poorer-than-expected showing in Quebec. While they won 10 seats, the same number they won in the 2006 election, they did not make the gains they had expected. The Tories' only major casualty of the night was Quebec candidate Michael Fortier, who sparked controversy with his appointment to cabinet as an unelected senator in 2006. Fortier resigned from the Senate to run as an MP in the riding of Vaudreuil-Soulanges, but lost to Bloc incumbent Meili Faille. The Conservative government's cuts to arts funding and Harper's campaign pledge of tougher penalties for youths convicted of serious crimes were widely met with an outcry in Quebec and appeared to galvanize support for Bloc Leader Gilles Duceppe. Gilles Duceppe addressed supporters in Montreal and said the Bloc Québécois had lived up to its promise to block a Tory majority. ((Jacques Boissinot/Canadian Press))While the Bloc jumped to an early lead in Quebec, they finished election night with one less seat than they won in the 2006 contests, winning 50 seats of the 75 up for grabs in the province. 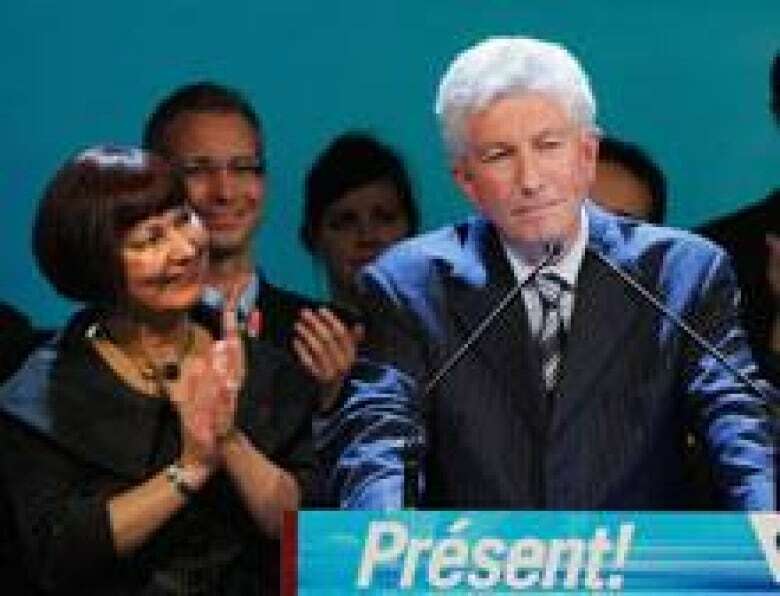 Speaking in Montreal, Duceppe told supporters the party achieved its objective. "Without the Bloc Québécois tonight, Mr. Harper would have formed a majority government," he said. The Liberals gained a seat in the province, pushing their total to after 13 after Justin Trudeau, the son of former prime minister Pierre Trudeau, prevailed in the Montreal riding of Papineau. The New Democrats held their sole seat in Quebec, while Independent MP André Arthur held his seat in the Portneuf-Jacques-Cartier riding in the Quebec City area. Addressing reporters on Wednesday, Layton said the election results indicated "there's signs of real progress" for his party, But he said "more work" was needed in order for the New Democrats, who ran an election campaign casting Layton in a prime ministerial light, to take power. 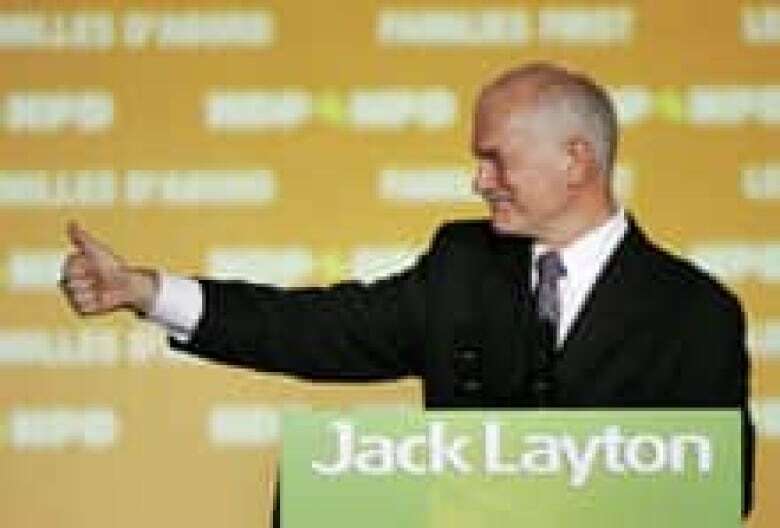 NDP Leader Jack Layton told supporters in Toronto that no party would be able to implement an agenda without support from other parties. ((Mike Cassese/Reuters))Layton said his party's modest gains put him in a better position to become prime minister in the future. "In fact, we're in a stronger position to pursue [the office of Prime Minister] now with some important new seats that we've been able to win – particularly in Alberta, in Newfoundland and Labrador, and for the first time ever an elected member of parliament in a general election from Quebec." Speaking in Toronto late Tuesday night, NDP Leader Jack Layton said the result of a second Conservative minority government means "no party has a mandate to implement an agenda without agreement from the other parties." In Ontario, returns suggested vote-splitting and a strong NDP showing were cutting into Liberal support in the party's traditional heartland. 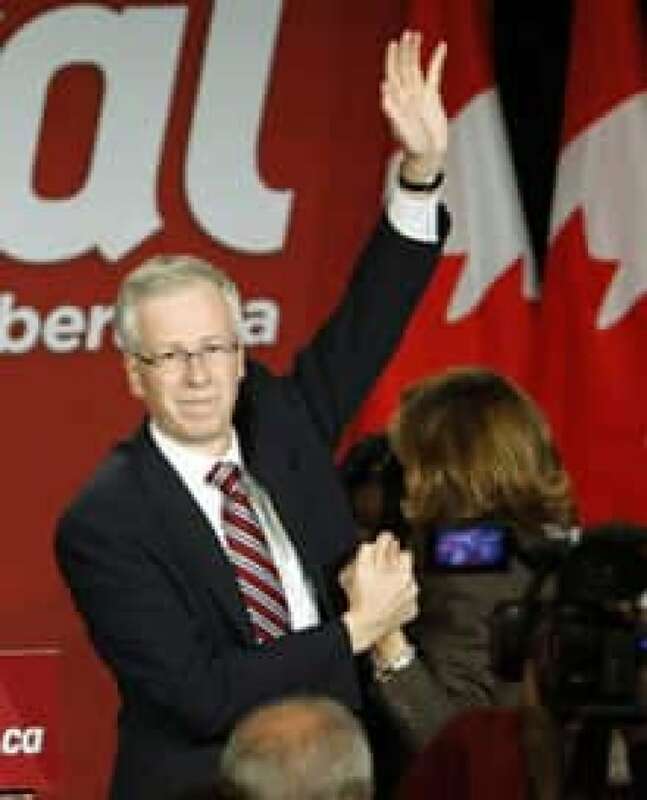 With the Liberal popular support sinking to a level not seen since 1867, there was renewed speculation over the future of party leader Stéphane Dion. He conceded defeat early Wednesday morning, but made no mention of resigning as Opposition leader. Stéphane Dion, in Montreal, made no mention of resigning as Opposition leader. ((Fred Chartrand/Canadian Press))"Canadians have asked me to be leader of the Opposition and I accept this responsibility with honour," he said at his campaign headquarters in Montreal early Wednesday. "The next few months will be crucial for our country. It is clear that our economy, indeed the global economic crisis, is the most important issue facing our country at this time." Dion did not make any public appearances during the day on Wednesday. The country's 40th general election began on Sept. 7 when Harper asked Gov. Gen. Michaëlle Jean to dissolve Parliament. The last time Canadians elected three consecutive minority Parliaments was in the 1960s: 1962, 1963 and 1965. In this latest general election, a total of 13,832,972 of the 23,401,064 eligible voters cast ballots, Elections Canada figures showed as of noon ET Wednesday. The 59.1 per cent voter turnout rate appears to be a record low. Based on preliminary results from across the country, Elections Canada said there were no electoral districts in which an automatic recount was required. An automatic recount occurs when there is a spread of less than 1/1,000th of the valid votes cast, Elections Canada spokesman John Enright told CBCNews.ca. Over the next few days results will be validated, final tabulations will be made, and official results will be available, Enright said. Harper's Conservatives began this year's campaign with a huge financial advantage over the other parties and with polls suggesting they had the potential to win a majority in the House of Commons. The Conservatives led the Liberals by as much as 17 points in early opinion polls. But that lead shrank steadily, with the Liberals pulling within striking range of the Tories just over halfway through the 37-day campaign amid a meltdown in the world's financial markets sparked by the U.S. credit crisis. Unlike Dion, who vowed he would not quit as leader after a Liberal loss, Harper said he would step down as party head if the Tories were defeated. 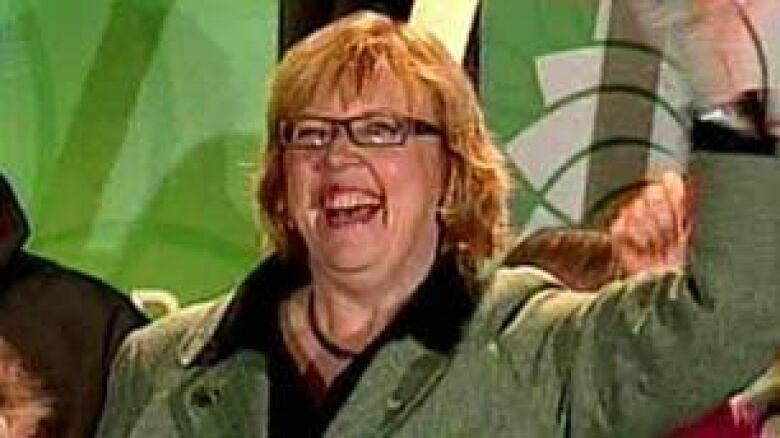 Green Party Leader Elizabeth May acknowledges supporters as she concedes defeat to Conservative incumbent Peter MacKay in the Nova Scotia riding of Central Nova. ((CBC))Harper, Layton and Dion breezed to victories in their own ridings, but Green Leader Elizabeth May failed in her bid to unseat Conservative incumbent and Defence Minister Peter MacKay in the Nova Scotia riding of Central Nova. "I can't say I'm overjoyed, but we ran a very strong campaign," May said early Wednesday. "If the kids five years up could have voted, I would have won in a landslide," she told supporters at her campaign headquarters. MacKay said the "highly unpopular" carbon tax proposal of the Liberals and the Greens was a factor in his victory because of the region's heavy reliance on transportation. "A lot of people were obviously concerned about the impact on their home heating oil and at their gas tanks, and basically a hit on every single item that comes and leaves this province," he told CBC News. ABC spells shutout for Tories in N.L. The first results came in from Newfoundland and Labrador, where voters appeared to heed Premier Danny Williams's "Anything But Conservative" appeal by shutting out the Tories in the province. Liberals were elected in six of the province's seven ridings, while Jack Harris, a former MP and provincial NDP leader who was also Williams's longtime law firm partner, was elected in a landslide for the New Democrats in St. John's East. Williams, a Progressive Conservative, began his campaign in response to what he said was Harper's broken promise to rearrange the equalization formula for his province to include offshore oil and gas revenues in the 2007 federal budget. Fabian Manning, the Conservative incumbent in Avalon and the Tories' last remaining hope in the province, lost his seat to the Liberals' Scott Andrews. The often rancorous campaign was punctuated by several gaffes by party leaders, as well as the withdrawal of several candidates over past actions, writings and statements that emerged to haunt their political aspirations in the internet age. Later in the campaign, party leaders scrambled to keep up with developments in the global economic crisis, which fuelled growing financial fears among Canadians, pushing the economy to the centre stage of the campaign. The Conservatives had campaigned on a series of what Harper described as modest, affordable proposals of tax reductions to benefit Canadians at a time of financial uncertainty. The party also portrayed the spending pledges and proposed tax measures of the Liberals and New Democrats as dangerous and unrealistic. Dion appealed to progressive voters — including NDP and Green supporters — to "go green, vote red" and back his party to form a government and prevent what he said was Harper's "right-wing agenda." The Liberal leader faced blistering criticism from the Tories for his $15-billion Green Shift proposal, which called for personal income-tax cuts paid for by a $10-per-tonne levy on carbon fuels. The four opposition leaders accused the previous Conservative government of mismanaging Canada's economy amid massive job losses in Central Canada's manufacturing industry, and they asserted the Tories had no plan to deal with the current financial turmoil. Meanwhile Layton, portraying the New Democrats as the real alternative to the Tories, stepped up his criticism of Dion for the Liberals' refusal to stand against the Harper government on dozens of confidence votes in the previous Parliament. When the election was called in early September, the Conservatives held 127 seats, the Liberals had 95, the Bloc Québécois held 48, the NDP had 30 and the Greens had one (B.C. Liberal-turned-Independent MP Blair Wilson joined the Greens days before the election call). Independents held three seats and another four seats were vacant. YOUR VIEW: Are minority governments good for Canada?